I find it very rare these days to find a tale both original in its telling and unique in its plot. The term mass fiction or popular genre has become an excuse to present us with the same story over, and over and over again. It’s therefore definitively worth mentioning when one finds a book that is unique and the only one of its kind. 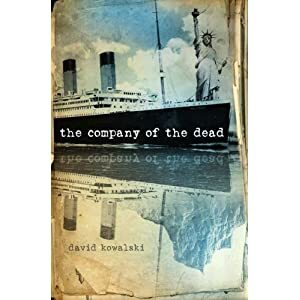 This was how I found David J. Kowalski’s novel The Company of the Dead to be. Set against the backdrop of the world’s worst maritime disaster, the sinking of the RMS Titanic, Kowalski brings us a one of a kind combination of sci-fi, history and dash of conspiracy to weave a tale of epic proportions and scope. In this story, Kowalski creates a world in which that fateful voyage of 15 April 1912 was changed by a man from the future in an attempt to save the ship from its legacy. His actions sets off a series of events that changes our world as we know it, where America never took part in World War One, choosing rather to stand aside and watch the German and Japanese forces shape the world as they conquered it. In this world that Kowalski created a hundred years after the Titanic’s changed fate, England is the hesitant ally of Germany and North America is a continent divided between Japanese and German forces still standing on the brink of war. One man, Joseph Kennedy, grand-nephew of John F. Kennedy has become aware of the fact that time had not run it’s original intended course and in an attempt to restore time to its rightful order, he sets off with a group of people to change history. The timing of this book’s release could not be better. Next month will mark the 100 year anniversary of the Titanic disaster, a time line which also features in this book. To me, this story is original and a first of its kind. The plot is solid, the world believable and the characters determined to complete what they set out to do. I had no trouble imagining the world that Kowalski created and the images he used almost seemed to spring from memory rather than his pages. If you are a sci-fi fan with a history obsession such as myself this is a novel in which to lose yourself. Time and again I found myself marveling at the amount of work and effort that Kowalski must’ve put into this story. It came as no surprise to me when I discovered that the author was a medical doctor and had spend no less than then years working on this. The amount of research that has gone into it definitively paid off. There is an almost clinical precision to the way the book was written and time and again I found myself thinking that the ideas are presented like intellectual facts rather than fiction. This is, unfortunately, not the kind of book that you can hastily read between chores, studies or clients. The presentation of both the facts and the plot demands the reader’s full attention and where as Kowalski has successfully managed to create a parallel history to ours which had driven itself to the edge of nuclear war, I did find that sometimes the actual details in the present were a bit blurry. Characters moved very quickly from one scene to the next with very little description of not only their surroundings but also the means of how they got there. Seemingly important action sequences are glanced over and the author mainly leaves it up to the reader to fill in the blank spaces. I also found it difficult in the beginning to imagine the characters, purely because – like their movement, they aren’t described in a way that sets them apart from their fellow company members. I felt as if I was wasting precious time going back to previous pages trying to determine who exactly a specific person was and what his actions were. Regardless of the lack of descriptions that I mentioned above, I never found myself for one moment questioning Kowalski’s plot and motives of the story. The characters, the history and the ghostly presence of a man who had poured his heart into this work, carried the book and endeared it to me. I have read all kinds of books and genres and over the past few years very few of them had stood out in my memory. The Company of the Dead does so and I know that I will return to this book, reread it and enjoy it just as much as the first time (if not more because I am familiar with the author’s style and the created world). I strongly feel that David J. Kowalski can take pride in what he accomplished with this. It has already won two awards namely the Best Science Fiction Novel at the Aurealis Awards in Brisbane and the Golden Aurelis for Best Novel. I, for one, am anxiously waiting to see what Kowalski can come up with next and am looking forward to any future titles that he is working on.